We didn't have the chance to watch tonight's game. And we had no opportunity to even hear Charlie & Dave. Real work got in the way for both The African Queen and I today. This long and extended working Tuesday found me shuttling between The White House & Capitol Hill, making it impossible to see Craig Stammen pitch maybe his best game ever in The Major Leagues. On the very evening, Alberto Gonzalez went four for four at the plate--helping Our Washington Nationals to end their five game losing streak. Following our team in spirit this evening, but not knowing a whole lot about Washington's 7-2 victory over The Atlanta Braves, here's a good side story from tonight instead--that perfectly sums up this latest of baseball days. While staking out Senator Christopher Dodd (D-Connecticut) this evening at a Finance Committee hearing waiting patiently for some comments--here comes Congressman Pete Sessions (R-Texas, Dallas Area) walking down the corridor at the Rayburn House Office Building fully dressed in the official Major League uniform of The Texas Rangers--white pants, red socks, red alternate "Texas" jersey and blue "T" cap. He looked good. He really did. SBF: Congressman, you playing in the Congressional Baseball Game tonight? Sessions: Yeah (pointing over toward me), You better believe it. And I'm starting (smiling proudly). Congressman's aide: You need to come cover the game instead of this hearing--he's going to light it up. Sessions: I wouldn't go that far (chuckling). Aide: But you never know. SBF: If you play as well as you dress sir, I'll pass the word along to the team. Everyone laughing as Congressman Sessions exits the Rayburn House Office Building to head over to Nationals Park. You gotta love the fact that the Congressman was into the spirit of the moment. Just like Sohna and I were in wishing our Washington Nationals well while finishing out two very long personal work days. What happened in the bottom of the 7th inning when The Braves plated five runs was immaterial because this ball game was decided in the top of the 7th inning at Turner Field in Atlanta when the bat was taken out of Ian Desmond's hands. After Roger Bernadina doubled leading off for Our Washington Nationals, Our Number Six was ordered to sacrifice bunt, not step up to the plate and attempt to drive the go-head run home. Not given the opportunity to be a gamer. Our Washington Nationals were locked up a scoreless duel with The Atlanta Braves at that time. Tim Hudson was throwing is usual great stuff on the mound for The Brav-OS. Stephen Strasburg, although not overly sharp, had matched Atlanta's ace through six complete innings of zeros. But now was Our Number 37's time to go. His time to head toward the dugout and stay there. Knowing Washington's Bullpen has been overused during this latest losing streak. Knowing, once again, a huge crowd of 42,889 came to The Braves home ballpark tonight to see baseball's latest phenom. What any knowing fan rooting for Washington needed to understand--was that Our Washington Nationals needed to win this game. And when Desmond was signaled to give himself up for out number one in the top of the 7th--only to advance Bernadina to 3rd Base--the probability for D.C.'s Team to put the go-ahead run on the board was lessened exponentially. Alberto Gonzalez was the next scheduled hitter for Washington. As sharp of a fielder as Our Number 12 is (and he was a part of two well turned double plays this evening), Alberto can barely hit his weight. Desmond, despite his slump of late at the plate, has been pretty good with runners in scoring position most all season. Considering that the swift Roger Bernadina can score as easily from second base as from 3rd (and fast enough to score from 1st on some well placed base hits)--why give up an easy out with Gonzalez and Stephen Strasburg the next available scheduled batters? This decision from a team that's having trouble scoring any runs late--sometimes at all? That makes no sense even though Our Manager Jim Riggleman did, at first, bluff by placing Adam Kennedy in the on deck circle to bat for Strasburg. Tim Hudson is one especially good pitcher. When his sinker is working, he's virtually impossible to score a single run on. This top of the 7th inning was Our Washington Nationals sole chance this evening to pull ahead. Washington then coming up short by wasting an out with Desmond at the plate and deciding to keep Stephen Strasburg in the game--unnecessarily--with two outs. Even though Our Number 37 had only thrown 73 pitches through six complete to that point, he most definitely was not in complete control. He should have been taken out for a pinch hitter. He should have been given the opportunity to record a win after Bernadina doubled leading off the top of the 7th. He also should have been sat down so one of his teammates could have a better chance to get him the lead. Not sent out to the mound in the bottom of the 7th to suffer another bad loss--just because Washington's bullpen has been overused of late. The point of any baseball game is to win. 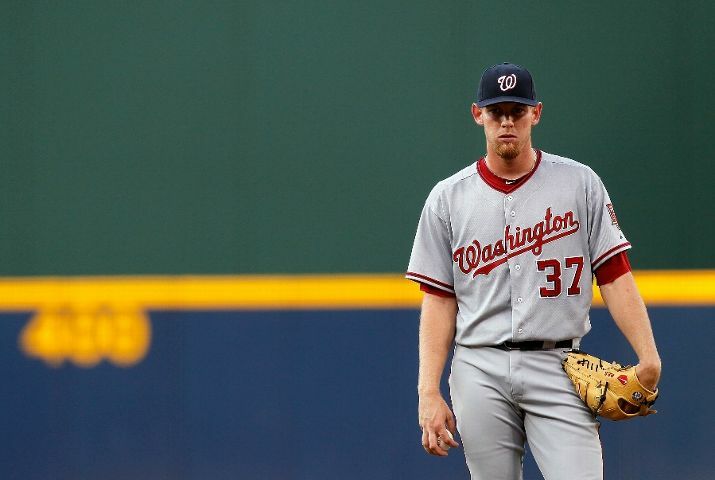 Stephen Strasburg is developing fine on his own. What this 21-Year Old has accomplished over his first five starts in his Big League Career is remarkable. But Our Washington Nationals shouldn't keep pushing him out there with the thought only Strasburg can keep them in any ball game. That's not going to satisfy anyone in the long run. And it didn't come close to recording a Curly "W" tonight when Stephen was hit hard in the bottom of the 7th. If Stephen Strasburg is truly our future, then let him go out ON TOP with a tie or a lead for now--not suffer while his teammates catch up to his greatness. Again, he deserved better tonight and was denied. Final Score from Turner Field where The Number 1 Overall Pick in the 2009 Draft was stifled by not just The Brav-OS, but a veteran pitcher in Tim Hudson who understands how to win: The Atlanta Braves 5 and Our Washington Nationals 0. Loss Number 43 of 2010 is not the real subject matter here, Washington's offense against Tim Hudson is. D.C.'s Team was given their one true chance to push ahead in the top of the 7th against a hurler that has always dominated them. But played the game conservatively, bunting with an RBI man at the plate, and letting their phenom pitcher bat with two outs and a runner on 3rd in a scoreless affair. All at the very point, Stephen Strasburg should have been taking a rest and preserved. Not forsaken, in the HOPES of garnering a victory. Those days will surely come for Stephen Strasburg. Unfortunately, today was not one of those days. He shouldn't have been placed in such a predicament on the mound. Drawing big crowds are nice and that's again why so many people showed up in Atlanta this evening (42,889). But the object of this game, and any game for that matter, is for Our Washington Nationals to win. A great talent like Strasburg should not be thrown out there late--just because there is a feeling no one else is better available in relief. If you give our hitters a chance to make a difference. If you let our batting order decide a close ballgame. If you don't give up an out in a scoreless game, unnecessarily, simply to move a fast runner already in scoring position 90 feet farther to 3rd. And if you don't let two weak hitters step to the plate afterwards-- you might actually find the go ahead hit--the go ahead run. You might find a few more gamers to trust with a game on the line. Stephen Strasburg is a rookie, but he has shown to be a gamer. What Our Washington Nationals need to find out is how many other gamers exist on their roster? Players that can be difference makers in close ball games. Handed the opportunity in the top of the 7th inning tonight to mature, Ian Desmond's bat was taken out of his hands at Turner Field in Atlanta by a managerial decison. So no one found out whether this rookie shortstop can really develop into a gamer himself. By letting your batters swing their bats, only then will Our Washington Nationals be able to overcome all obstacles and develop multiple gamers themselves. Players to trust with any game on the line--in any situation. P.S. Just one footnote--Roger Bernadina has really stepped up his game in June. Our Number 2 has always been an excellent fielder, but now for the first time in his career, Roger appears to be hitting with confidence. He seems relaxed. The results showing Bernadina now spraying multiple hits to the opposite field--sometimes with power. The positive signs of a man that finally understands how to hit in The Big Leagues. He's been mighty impressive over the last month. 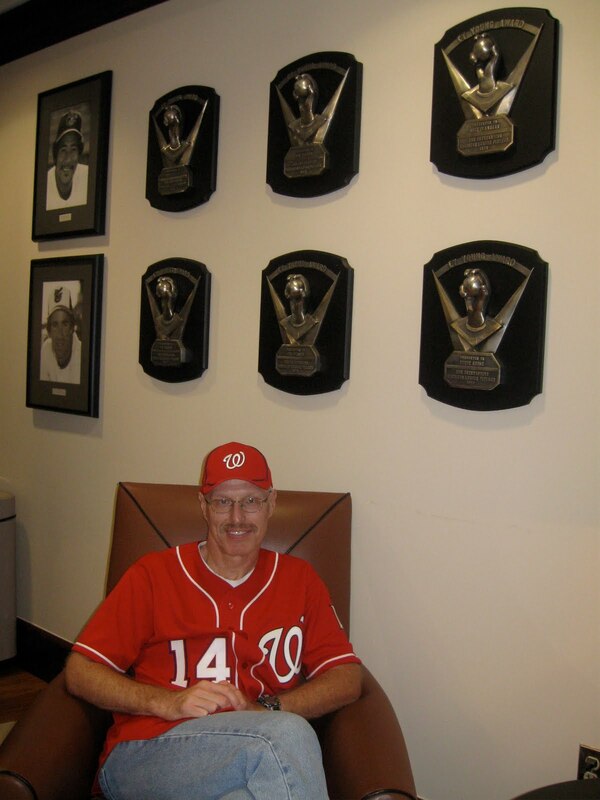 And it reminds me of Mark Scialabba, now Washington's Director of Minor League Operations, telling Nats320 last year that Bernadina had failed initially at every level of the professional game, but never gave up and rightfully graduated due to his hard work. Maybe, just maybe, Roger Bernadina is becoming a legitimate Major League Baseball Player. As Baltimore's Scott Moore stepped on first base to record the final out today at Camden Yards, The African Queen turned to me and stated: "Losing to any team in baseball I can understand, but being swept by The Orioles is totally unacceptable." Not much more to add to that comment because for the 3rd consecutive day Our Washington Nationals blew a lead of least three runs. Washington's offense shut down after the fifth inning and their defense and pitching continued a downward trend. Another inopportune error was critical to this latest downfall. Adam Kennedy didn't hold up his pivot throw to first base on a double play grounder--while being taken out at second base by Scott Moore. Kennedy's rush attempt to force the second out scooted well past Michael Morse at first base and into The Orioles' dugout--forcing D.C.'s team into a tie game in the bottom of the 5th. There is little going right for Our Washington Nationals these days--76 games into the 2010 season. Just look at Mr." No Nonsense". On this hot and humid Sunday afternoon, Tyler Clippard looked tired on the mound. For his second consecutive appearance Clippard was anything but "No Nonsense"--giving up the game winning run--after two were out--in the bottom of the 8th. He was hit with his 5th loss of the season, and second of the weekend. Every pitch of his up, most every pitch hittable. Leaving us wondering whether Tyler's thrown far too many outings during the first half of 2010. Doesn't it seem like he's been called to duty most every single game? Sohna and I didn't attend this final game against The Orioles at Camden Yards this weekend, we had plenty of errands to attend to. Shopping for those necessities, the essential items needed for every day needs. The requirements to sustain and recharge ourselves. The basic elements now missing from Our Washington Nationals play these days. Over the past few weeks, when the pitching has been fine, the offense and defense has broken down. When Washington has scored enough runs, the pitching has broken down. And when the pitching and offense find themselves on the same page--the defense breaks down. All those issues came into play this weekend in Baltimore. The result: a three game sweep at the hands of The Baltimore Orioles. The fourth time this month, D.C.'s Team has lost all three games played in a series. Our Washington Nationals need to recharge their batteries. They need to re-find their game. Their play this weekend showing little life after Friday night's most awful loss. Their psyche seemingly zapped. A lost spirit that may have little to do with the oppressive heat and humidity overtaking the Washington/Baltimore metropolitan area. As The African Queen stated, losing to any team in the Major Leagues is understandable, but being swept by The Baltimore Orioles is definitely not--"especially with how we played," Sohna concluded, "because we are better than that." Final score from Camden Yards where D.C.'s Team lost for the third consecutive day to a supposedly lesser team: The Baltimore Orioles 4 and Our Washington Nationals 3. Being swept again, loss number 43 of 2010 put D.C.'s team 10 games under .500 as the All-Star break nears. And with a crucial series of games upcoming with Atlanta, The New York Mets, San Diego and San Francisco--all good teams--stopping this latest slide will surely be tested. When The Washington Senators of my youth played The Baltimore Orioles, The O's beat on The Nats like a drum. From 1969-1971, the Ted Williams years as manager for D.C., Baltimore was the best team in The American League. They had a great lineup and the best pitching. Three time A.L. Champions, 1970 World Series Champion. And every single time they seemingly played My Washington Senators--The Baltimore Orioles crushed them or came from behind to win--always leaving a bitter taste in my mouth. With The New York Yankees haven fallen on hard times back in those days, The Orioles were the team to fear. During the final three seasons of The Washington Senators existence before moving to Arlington, Texas and becoming The Rangers--The O's beat The Nats 42 times out of 54 total games played. So, let's just repeat that stat: Washington 12 Wins and 42 Losses against The Baltimore Orioles from 1969 through 1971. 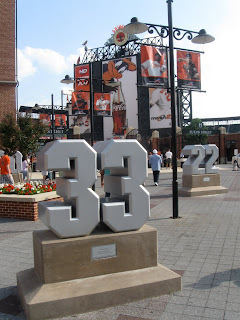 All that stated because today at Camden Yards in Baltimore, The Orioles celebrated the 40th Anniversary of their 1970 World Series Championship Team. They honored their players and surviving family members in a touching pre-game ceremony. Then, toasted the reunion with Baltimore's 2010 Version suiting up in Vintage 1970's Throwback home uniforms and Our Washington Nationals donning 1970's Washington Senators gray away jerseys, pants and red socks. And just like old times, they played liked the 1970's version of My Washington Senators. The Retro Orioles came back to beat up on The Retro Nats. It didn't matter that Our Washington Nationals staked themselves to a five run lead. A huge advantage for the second consecutive night. It didn't matter that Livan Hernandez was given a comfortable margin to work with. It didn't matter that Baltimore Starter, Brad Bergeson, lasted just four innings. What mattered was that The O's Corey Patterson played like Don Buford (leading off and being a pest). Miguel Tejada like Paul Blair (making the plays in the field, getting on base and driving key runs home), Matt Wieters--Elrod Hendricks (clutch RBI man) and Adam Jones providing the fire power always on display when Frank Robinson stepped to the plate. Of course, Adam Jones homered to left center to get Baltimore's comeback started in the bottom of the 4th. The Orioles providing the pressure that never allows the defense to rest. The type of play The O's were known for 40 years ago--today. Yes, a vintage display of baseball at Oriole Park this Saturday. The Baltimore Orioles acting like a great team from their past while Our Washington Nationals performed the duty of the second division team--take the lead early, try to hold on valiantly, but eventually lose to the opposing side--thanks to a letdown. When Baltimore's Luke Scott scored the eventual game winning run in the bottom of the 7th inning on a Drew Storen wild pitch, it might as well have been Boog Powell lumbering home after a Joe Grzenda, Horacio Pina or even Darold Knowles uncorked wild one. That's how My Washington Senators used to lose ball games in 1970. And that's how Our Washington Nationals lost another close game they should have won today. Livan Hernandez losing his composure in the bottom of the 5th by allowing four Baltimore singles and one double--resulting in four runs--to tie up this game. And Drew Storen losing his piece of mind when he set sail a curve ball that bounced on the plate with the go ahead run on third base. A rookie mistake always rudely taught in this results and execution game known as Major League Baseball. You've got to play to win, but you also always have to play well--consistently--to be successful. The 1970 Baltimore Orioles celebrated today at Oriole Park were exactly that type of team. A franchise My Washington Senators could never emulate. A team Our Washington Nationals hope to become--but just not today. Final Score from Camden Yards where the retro look was pretty darn cool: The Baltimore Orioles 6 and Our Washington Nationals 5. Loss number 42 of 2010 was not as awful or devastating as last night's wicked defeat, but it was just as stressful for a D.C. Team that hasn't found their footing these past six weeks. Stephen Strasburg has certainly arrived, but as has been quickly determined--he's not the savior--only the harbinger of possible things to come. If you haven't realized it by now--it takes a team to win. A complete roster of 25 guys--not just one fellow pitching every 5th day. The 1970 Baltimore Orioles could do it all--with pitching, hitting and defense. That's why they became World Champions. One day, Our Washington Nationals will reach that pinnacle in the sport, but before those halcyon days commence, they are going to need to play better all around baseball--a full nine innings worth--day after day after night after night. You can't be losing five and six run leads every night. And you can't be losing consecutive games to the team with worst record in Major League Baseball--even if the games are played on their home turf. The 2010 Baltimore Orioles are not The 1970 Baltimore Orioles. But The 2010 Version of Our Washington Nationals this late Saturday afternoon, turned to evening contest, gave the impression The O's were such world beaters of 40 years past--by playing like The 1970 Version of My Washington Senators. That can't happen if you are going to be successful. By the way--no one mentioned this today at the ballpark--as far as we know. But exactly 40 years ago today--June 26th, 1970--Frank Robinson hit two grand slams in consecutive at-bats against The Washington Senators at RFK Stadium. Joe Coleman gave up the first homer. Joe Grzenda the second. I know and I remember--because I was there. One of 13,194 in attendance on a Friday summer evening when I was 10 years old--having just graduated from the 5th grade. To this day, Frank Robby always jokes that he was pissed at his teammate Paul Blair who made the final out for Baltimore in the top of the 9th that night--with the bases loaded again. 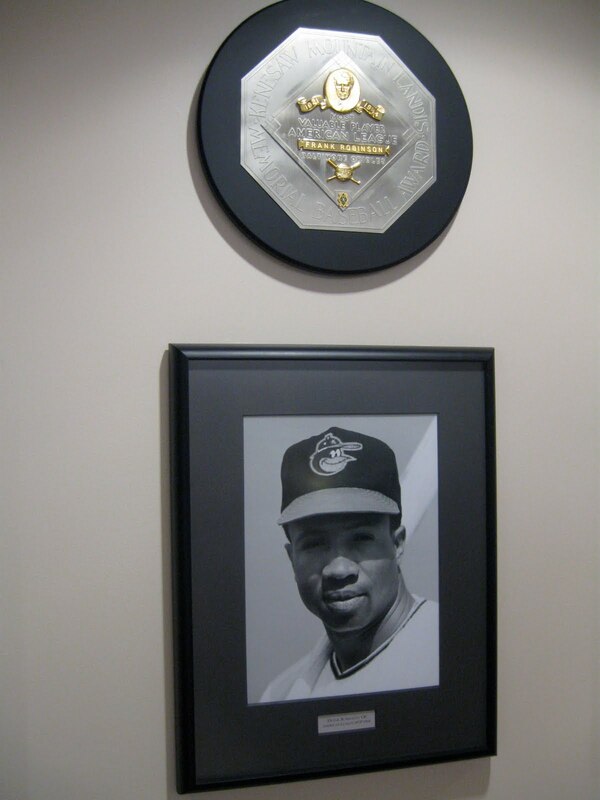 Frank Robinson wanted the opportunity to hit three grand slams in one game. A feat that has never occurred in the sport. Ironically, those two grand slams hit by Robinson were the only two he EVER HIT IN HIS CAREER!! The man socked out 586 career home runs but his only two grand slams in the big leagues occurred on June 26th, 1970. And I was there. Proud of it too. Livan Hernandez let it all slip away today. Given a five run lead, he couldn't hold it. When Matt Wieters tied this game up at five on a two out single to right scoring Tejada and Nick Markakis in the bottom of the 5th--you could not only see Livo's shoulder's slump, but just about every single player wearing a Senators Jersey today on the field. Almost, the here we go again feeling that Washington never recovered from. Ole Number 61 didn't receive the loss, that went to Sean Burnett in the 7th, but Hernandez saw his ERA rise above three for the first time all season: 3.10. He didn't walk anyone, but Livan allowed 11 hits, not enough scattered. And that cost him his advantage. He's up and down, up and down--and today was a down day for Sean Burnett. Our Number 17 allowing a leadoff walk in the bottom of the 7th to Nick Markakis. The set up for the game winning run after Markakis was forced out on a Luke Scott grounder. Scott eventually scoring when Matt Wieters singled to center and Drew Storen relieved Burnett and tossed his wild pitch to Ty Wigginton that decided this game. Burnett now 0-4 for the season, but carrying a 2.81 ERA. Washington got on the board with 4 runs in the top of the 3rd when Adam Dunn ripped a double down the right field line off Bergeson scoring Ian Desmond and Cristian Guzman. Ryan Zimmerman moved to 3rd. Pudge Rodriguez followed with a ground out to plate Zimmy. And Roger Bernadina got Dunn home with an rbi single to left. Washington's fifth and final run scoring on a sacrifice fly by "The Guz" sending Ian Desmond home. Dunn looking a little like My Favorite Player Of All Time!! Frank Howard in that retro uni. Only seven total hits today by Washington. Three walks taken, but only one hit and one walk over the five final innings played. Our Washington Nationals are struggling to finish teams off when they have the lead--even a comfortable lead. The throwback uniforms worn today by both teams were fabulous. The Orioles vintage look with the orange, black and white striped socks--classic. That uniform stands the test of time. And as a life long Washington Senators Fan, it warmed the heart to see "Senators" in script being worn again in a Major League Baseball Game. That's the uniform of My Washington Senators for their final three years of existence. And that's a uniform I've never forgotten. Although, the "Senators" script on these retro uniforms was a little larger today than back in the day. Drew Storen was rocking the red socks today. He wore his stirrups exactly in sync with what I wore in my playing days. As The African Queen can attest, I couldn't stop talking about Drew Storen and his red socks this afternoon. That was just so cool to see. He wore them PERFECTLY!! Just the right amount of half moon red showing down from his pant lengths. As we always do when visiting ballparks, Sohna and I explore all the facilities. Yesterday, our tickets were behind the 3rd Base Dugout in the field box seats. Today was our Club Level ticket day at Camden Yards. We've watched games there before, but the renovations inside the club have made the place even better than previously seen. A Grand Entrance off the elevator lobby. 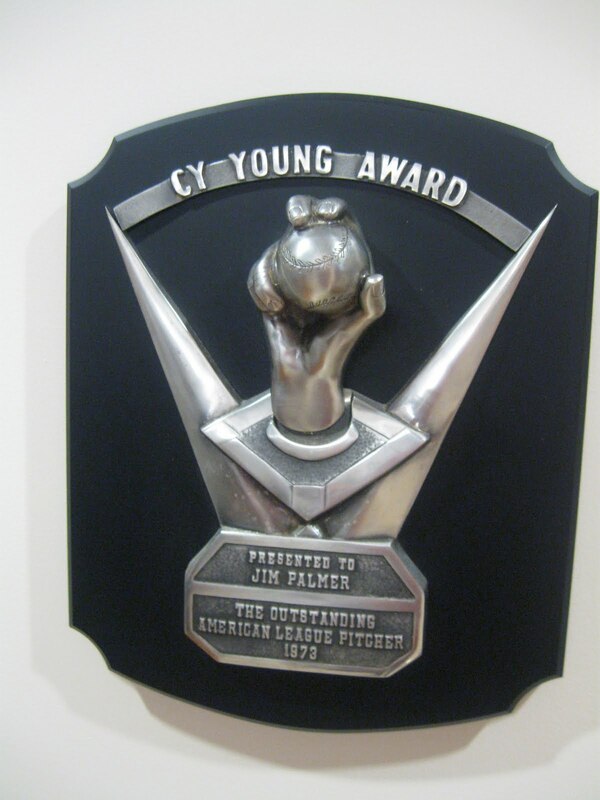 The World Series Championship Trophies, Cy Young Award Winner & MVP Plaques--all on display. Vintage photos of every single team in Baltimore History. Just great stuff--and that's just the memorabilia. The club space is extremely well laid out. Plenty of walking room, dining and lounge seating areas. We can't say enough about how much we liked it. The outside seating area for ticket holders in The Stars & Stripes Club at Nationals Park is far superior than The Club Level at Camden Yards--no comparison in fact for leg room and seating comfort when watching any game. But the inside amenities at Oriole Park's Club Level far more attractive than it's counterpart on South Capitol Street. And that's said understanding that Camden Yards does not have a Presidents Club or Diamond Club. There are no premium seats in Baltimore--so their Club Level is what their franchise has spent top dollar on. 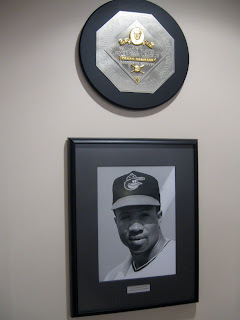 It also doesn't hurt that The Orioles have 57 years of history to adorn their walls with collectibles. Our Washington Nationals just over six. Big Difference. And finally, it was quite funny to see Nationals Season Ticket Holder Fran and his wife, Jill, with tickets alongside Sohna and I. Each of us had purchased our seats on Stubhub!! recently. And by chance ended up sitting right next to each other. Sitting waterside at an Inner Harbor Restaurant early this morning in Baltimore, our friend Pat looks over at me and says: "You still looked steamed?" SBF: "I am. That was an awful loss to an awful team in the most awful way imaginable." The latest chapter in this Tale Between Two Cities finished when Our Washington Nationals could not turn a tailor made double play in the bottom of the 9th inning at Camden Yards. What seemed like a simple 6-4-3 inning ender was blown after Ian Desmond scooped up The Baltimore Orioles Julio Lugo's grounder at shortstop and tossed the baseball swiftly to Cristian Guzman coming across second base. The problem? "The Guz" was arriving a little late and a little awkwardly on the bag, catching the baseball to record out number two, but then proceeded to relay a bad throw toward Adam Dunn at First Base. A low and away sinker that Our Number 44 failed to realize he had to stop--NO MATTER WHAT--with the game winning run motoring toward home. Instead of coming off the bag to block the baseball, Dunn stretched out with his glove hand and completely missed it. The last of four Washington errors for the evening was the most crucial and most damaging--as The O's Jake Fox raced home from second base with the game winning run. A 7-6 Baltimore Victory that brought what was left of a huge crowd of 43,484 roaring with delight at Oriole Park. And putting the look of dejection on the faces of every single fan of Our Washington Nationals having sat through this awful ending. 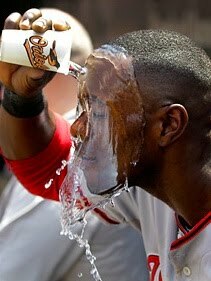 A six run lead blown by D.C.'s Team on the very night Nyjer Morgan played his finest game wearing a Nationals Uniform. Morgan with four hits, three runs scored, one run batted in and THE DEFENSIVE PLAY OF THIS YEAR and maybe, The Finest Defensive Play in the short history of Our Washington Nationals. In the bottom of the 3rd inning, Baltimore's Corey Patterson drove a deep fly to right center off a pitch from Washington's J.D. Martin. So high and so over the wall, there appeared to be no way for Nyjer to catch it. 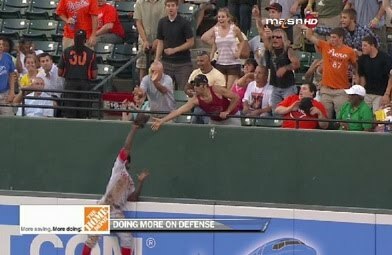 As the baseball carried over the wall--looking to settle near the front row of the Eutaw Street Bleachers, Our Number 1 used all his energy and speed to climb the padded wall at Camden Yards--reach out and over and snare the baseball with his right gloved hand--inches from a fan leaning over and attempting to retrieve the baseball himself. A FABULOUS PLAY that brought a standing ovation from just about every single person watching in the ballpark. And a wonderful helmet salute and bow in recognition from Patterson himself--toward Morgan in center field--for a job well done too. Great sportsmanship on behalf of Corey Patterson because he even knew that was one incredible catch. Nobody inside Camden Yards EXPECTED Our Number 1 to make the play. A sure home run robbed--with what looked like in the replays was performed--with the greatest of ease. Too bad Our Washington Nationals could not ease their way to victory over The Baltimore Orioles after taking a commanding 6-0 advantage? Instead, they fell apart and it was not just because of poor defensive play. Playing an American League Team in an American League Park, Our Manager Jim Riggleman wasted his bullpen by managing a National League Game. When J.D. Martin got into a little bit of trouble in the bottom of the 5th by giving up two runs--but still up by four--Manager Jim called on Doug Slaten FOR ONE BATTER. Two batters later, Miguel Batista allowed a third run to score. In the bottom of the sixth, Our Manager used Batista, Sean Burnett & Drew Storen to record the three outs. Burning through his bullpen unnecessarily with the lead, Jim Riggleman found himself in trouble for his quick hooks when Tyler Clippard was called on in the bottom of the 8th and produced his worst outing of the season--giving up the game tying runs--including a pinch hit two run homer to The O's Scott Moore. That's bound to happen to any pitcher, but Our Washington Nationals found themselves now in a huge bind. With only Tyler Walker, Joel Peralta and Matt Capps remaining to use out of the pen--Our Number 5 didn't trust those first two as options. Another crucial error, this time of the mental kind, when--quite incredibly--Tyler Clippard was sent out to the mound to pitch the bottom of the 9th inning after already having thrown 35 pitches in the bottom of the 8th. I vividly recall Pat stating upon seeing Tyler step out of the dugout: "This doesn't look good." And it didn't. In fact, it was a shocking personnel decision that quickly turned for the worse when Our Number 36 walked Matt Wieters with one out and gave up a single to that pesky Scott Moore to put Baltimore Runners on 1st and 2nd. The final set up for the final miscue for what should have been the final out of the bottom of the 9th inning. Instead, the set up for the game winning run. The sure double play ground ball hit by Julio Lugo off a Matt Capps' pitch to Ian Desmond at shortstop--the relay of which was thrown away by Cristian Guzman and never blocked by Adam Dunn manning 1st base. Pinch runner Jake Fox, running for Wieters, scoring the game winning run in the most awful way imaginable for any fan of Our Washington Nationals. When "Guzzie's" toss scooted past Dunn's glove at first base, I remained seated while thousands of Orioles fans sitting around us began screaming. "Game Over" I quietly said to Pat. "In the most awful way possible," he responded. Final Score from Camden Yards where not many regular season losses could hurt as much as this one: The Baltimore Orioles 7 and Our Washington Nationals 6. Loss Number 41 of 2010 just had to rip any D.C. Fan's heart out. For the first four and one half innings, Washington played one of it's better games of the season--quality starting pitching, timely hitting. Our offense was coming alive while Nyjer Morgan performed a miracle of a defensive gem. Everything was sailing along smoothly. Then, just like that, a completely different ballgame was witnessed over the final half. Guzman with two errors, Ian Desmond two--all resulting in four unearned runs scored by Baltimore. Our Manager Jim Riggleman burning through his bullpen unnecessarily playing with the Designated Hitter in an American League Park--on the very night he needed to save as many pitchers as possible for Baltimore's late surge. The evening in which "Clipp & Save" provided no discount to the Curly "W". Not only did this game provide an awful ending for Nats Fans, it was pretty depressing too. When The African Queen and I arrived back home early this morning around 2:30AM after a late dinner at The Inner Harbor with Pat & Christy--all we really wanted to do was sleep this latest defeat off. Our headaches too big after watching Our Washington Nationals lose in the most awful of ways imaginable. This latest edition of the Tale Of Two Cities concluding because D.C.'s Team simply could not turn a double play after burning through their bullpen. Leading 6-2 at the time--after Ian Desmond made a nice diving stop on a ground ball hit by Nick Markakis but proceeded to force a throw to second resulting in a run scoring error in the bottom of the 5th--Jim Riggleman decided to replace his starter J.D. Martin with Doug Slaten. With Baltimore runners now on 2nd and 3rd with one out and the powering hitting lefty Luke Scott stepping to the plate--that's a managerial decision that's fine for the moment. Scott has the capability of socking the baseball out of the park. Luke could have made this game a one run game with one swing of the bat. But after Slaten struck out Scott, it made little sense to replace him with Miguel Batista--who promptly gave up a run scoring single to Adam Jones. Just a waste of a relief pitcher. Only half way through this game, no reason to start using up your pitchers so quickly. We are playing American League rules here. 22 pitches were thrown by Batista, Burnett and Storen in a scoreless 6th inning to record all three outs. Sean Burnett called on just to face one batter--Corey Patterson. Again, it's still a three run game at the time--why? And when Clippard was roughed up pretty hard, Manager Jim didn't trust Walker or Peralta with the game on the line. Sending Tyler Clippard back to the mound in the 9th was a poor decision. Sometimes you just have to trust who you have, not just what you think you have. The Baltimore Orioles had no right to win this game. Our Washington Nationals handed it to them. What was Guzman thinking on that final play? Adam Dunn knocked in four runs on a double and sacrifice fly, but struck out twice with runners in scoring position and was a key player involved in that final defensive miscue of this game. He didn't make the bad throw, but as a first baseman in that situation--with the game winning run heading around third base--Adam Dunn has to stop that errant toss by Cristian Guzman--no matter what. No matter what--get your body in front of the ball--give your team the chance to face another batter. Matt Capps made the perfect pitch and received the perfect grounder. And watched his teammates mess up a perfect inning ending double play. Capps just dropped his head as Fox scored the winning run. Guzman and Dunn looked at each other, painfully, as they slowly walked off the field. Can't say much more about Nyjer Morgan, for the first time all season, he performed exactly as Our Washington Nationals have wanted to see all season--catalyst at the top of the order--defensive wizard in centerfield. A tremendous effort. Really. Hard to believe, but Camden Yards is nearly 20 years old now. And it's still as beautiful as ever. A great ballpark. Just a wonderful place to watch any baseball game. 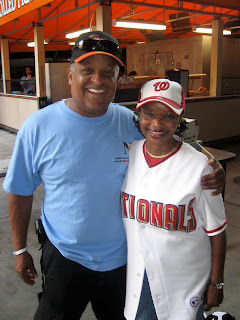 Loved catching up with Dwayne Herndon from Nationals Park's NJ's Pretzels (formerly Noah's) in Baltimore. Dwayne also has the pretzel concession for Oriole Park--his stand located on the first base side of the ballpark on the main concourse. No Curly "W" Pretzels sold there though. And for the second year in a row--the Navy Midshipmen were in attendance at a Nats/O's Game --taking pictures and signing autographs to promote Navy Football in Annapolis. After batting practice concluded, Stephen Strasburg signed autographs for a few fans standing behind the visitors dugout. Roger Bernadina signed for some time a little farther down the left field line. And finally, Sohna and I really had some great company tonight--Nationals Season Ticket Holders Pat & Christy sat with us for the game. Discounting the loss, we had a wonderful time at the ballpark. There is nothing better than to sit and watch a baseball game with those who also understand it. What Did Bluegrass Say To Zimmy? "It Has Not Been Pretty"